The numbers are in and, for the most part, no one that shops for the holidays is surprised. The majority of Americans preferred to shop online in 2017. And everyone better keep up. E-commerce and online sales are no longer just for the giants; it’s for small business too. But, does this mean the end of brick-and-mortar stores? Far from it. So, What are the Numbers Saying About Online Sales? Don’t want to take my word for it? Here are the numbers surrounding online sales and online shopping habits. 51% of Americans prefer shopping online. 96% of Americans with Internet have made a purchase online. 80% in the past 30 days. Online sales & shopping is projected to be a $523 billion business in 2020, up from $335 billion in 2015. 25% of online shoppers purchase from brick and mortar stores. 46% of small business don’t have a website. Think about that last one for a second. Almost half of the small businesses don’t even have a website. Half of U.S. companies aren’t taking advantage of an under-filled market. While that may be true, no business is too small to be online. And while you don’t have to be selling online if you don’t have the inventory—you should be showing off your product. People turn to online shopping for convenience and efficiency. Gone are the days of driving to the store to look at a product, taking pictures of it, driving home to see how it would look and then turning back to the store. Your customers want to know what you have, in what quantities, in what colors—and they want to know before they head to your store. For small businesses and brick-and-mortar stores, word-of-mouth use to be King. Now, having an online presence is often what drives people to your store. The online community tends to feel small. With chat rooms, social media and review sites like Yelp and TripAdvisor, people aren’t just wandering into random stores as often as in the past. They are coming with a purpose. Having an online presence drives people to your physical store because they have already found what they are looking for…in advance. Is Having a Website Enough? This year, mobile users overtook desktop users during Cyber Monday. All this means your website needs to be optimized for mobile users. Luckily, if you are using a web design platform, like WordPress, most themes either come mobile friendly or offer plugins that can optimize without the mess of coding or rebuilding. 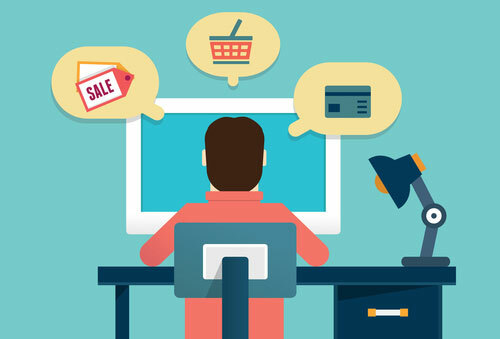 E-commerce may be the new greatest thing since sliced bread—if you take advantage of it. At the very least, all businesses need to have a website and online presence. It is no longer enough to have a welcoming storefront; you need an online front as well. For more information about online marketing options that will work for you, call us at 407-374-2924. Also, check out Be The Lime…the World has Enough Lemons for how to market you and your business online.